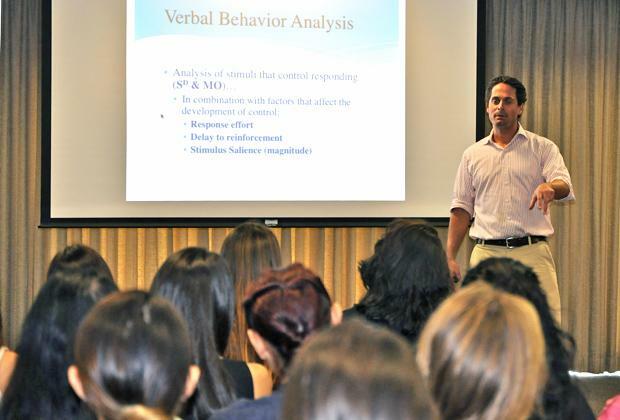 The Applied Behavior Analysis (ABA) Speaker Series, a sequence of presentations hosted by the psychology department in the College of Social and Behavioral Sciences, welcomed a speaker to discuss verbal behavior analysis Wednesday. 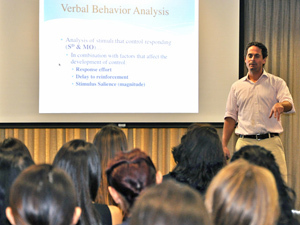 Dr. Daniel B. Shabani, known for Los Angeles’ Shabani Institute and his position as president of the California Association of Behavior Analysis, came to the Whitsett Room in Sierra Hall and spoke in front of a crowded room of students. Dr. Ellie Kazemi introduced Shabani to the audience and told attendees about Shabani’s educational experience, his long line of publications and studies and his love for his children. Shabani said the three views associated with language theory are biological, cognitive and environmental. When mentioning the biological view of language theory, he referred to Chomsky and the idea that language is innate. Chomsky is a linguist as well as a cognitive scientist, who believed that all people are born with the ability to communicate, no matter where they are from. With the cognitive view of language theory, Shabani discussed schemas, which are organized patterns, in relation to language and it being receptive and expressive. Stephanie Alvarez, freshman CTVA major, came to the lecture because a friend of hers mentioned it and it intrigued her right away. When observing verbal behavior, Shabani said that there is a lot of evidence supporting effectiveness. “You really start to do an analysis of the controlling variables and why they aren’t working… Behavior is constant. There is a reason for everything,” Shabani said. Before ending with a question and answer session, Dr. Shabani discussed three actual cases his institute dealt with in which the children were nonverbal. In all cases, the advancements made and not made were looked at with different tests that would create results.